Premier League football is over in 2018 but it has been a memorable year for league leaders Liverpool, who are chasing their first title in 29 years. Records were broken, history was made and plenty of goals were scored. So why would failure to win the title now be unprecedented for Liverpool, and what is Fulham’s unusual seven-year record? Here’s all the best stats from another year-ending round of fixtures. Liverpool’s year to win it? Liverpool move into the new year seven points ahead at the top of the table and no team in Premier League history has been so far clear on New Year’s Day and not gone on to win the title. Twice teams have been five points in front and finished second, but that is the biggest lead that has slipped at this stage. The Reds’ haul of 54 points is their best return at this point in any season by a margin of four points and, even more impressively, it is the third-best return by any side at this stage in top-flight history. Liverpool have conceded just eight goals – the fewest they have ever let in after 20 games – and it is only the third time in their history they have not lost a game at this stage. Manchester City manager Pep Guardiola even said the league leaders could be the “best team in the world right now”. 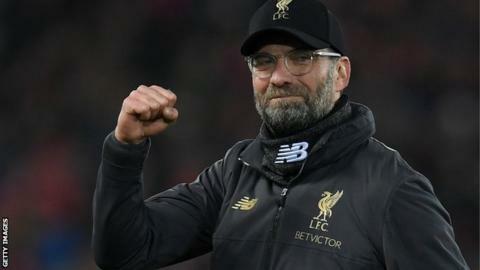 As if all that wasn’t enough, Liverpool became the first team to win all seven Premier League games in December – notoriously a particularly difficult month given fixture congestion. Manchester City, who achieved a record tally of 100 points last season, came close in 2017-18 but after six straight victories drew with Crystal Palace on New Year’s Eve. While Liverpool’s December was one to remember, for others it was entirely forgettable. Everton goalkeeper Jordan Pickford conceded 15 goals in the Premier League during the month, as many as he had in August, September, October and November combined. Huddersfield lost all seven of their Premier League matches – the first team to do so in a single calendar month since Leicester lost seven in April 2001. Manchester United’s win against Bournemouth was their third in a row – the first time they have achieved that since April. It means interim manager Ole Gunnar Solskjaer becomes just the third United boss to win his first three games (after Sir Matt Busby and Jose Mourinho). Solskjaer’s team have scored 12 goals in three games. They also scored four goals twice in eight days – the previous two four-goal performances were separated by more than a year. In two of Solskjaer’s three games United have scored inside the first five minutes. That was achieved only twice in 24 games under former boss Mourinho. Solskjaer is also starting to get the best out of World Cup winner and £89m midfielder Paul Pogba. The Frenchman has scored four goals in his three Premier League appearances under the Norwegian – as many as he had in his previous 20 under Mourinho – which moves him level with Anthony Martial as the club’s top scorer in all competitions (nine). Every football fan wants to see goals and Fulham never disappoint. It is an astonishing 158 league games since their last goalless draw at Craven Cottage – a run stretching back seven years to a 0-0 draw with Aston Villa on 13 August 2011. During that time, the Cottagers have been relegated from the Premier League, spent four years in the Championship and won a play-off final to secure promotion back to the top flight. That lengthy record was just seconds away from ending on Saturday, only for Aleksandar Mitrovic to score a stoppage-time winner as Fulham secured a priceless victory against bottom side Huddersfield. Fulham have conceded the most goals this season though (43), so a few clean sheets would not go amiss. If the Premier League was a calendar year competition, things would look slightly different based on results in 2018. Manchester City edge Liverpool at the top on goal difference, while Tottenham fall three points behind in a theoretical table. Excluding the teams relegated to the Championship and promoted to the top flight for 2018-19, Huddersfield have endured the worst year, with just 23 points from 17 matches. They failed to score in 20 Premier League games during 2018 – more than any other team – and also lost the most times (24). Liverpool recorded the most clean sheets (20) and picked up their best points-per-game ratio in 2018 (88), while Egyptian forward Mohamed Salah (28) scored three more goals than Tottenham’s Harry Kane (25). It was Manchester City who scored the most goals as a team though, scoring 96 goals – 12 more than Liverpool, who were second in the standings with 84. Despite finishing in seventh place last season, Burnley’s start to the 2018-19 campaign has been disappointing and it affects their results across the whole year. The Clarets conceded the most goals in 2018 (63) and had the worst goal difference of any team in the league (-28). But despite currently sitting third bottom in the table, they would be safe from the drop with a 15th-placed finish in the calendar year. Two youngsters who had significant ends to the year were Burnley’s Dwight McNeil and Southampton’s Kayne Ramsay. McNeil became the first teenager to score a Premier League goal for Sean Dyche’s side, at the age of 19 years and 38 days. Meanwhile, 18-year-old Ramsay was handed a debut in the 3-1 defeat by Manchester City at St Mary’s and was part of the youngest Southampton starting XI for five years. The players who took to the field had an average age of 24 years and 274 days, which was the youngest since a 1-1 draw with Newcastle in December 2013. What has 2019 got in store for them?